The fiscal health of U.S. cities continues to improve since a post-recession low of 2010, but revenues still aren’t growing fast enough. 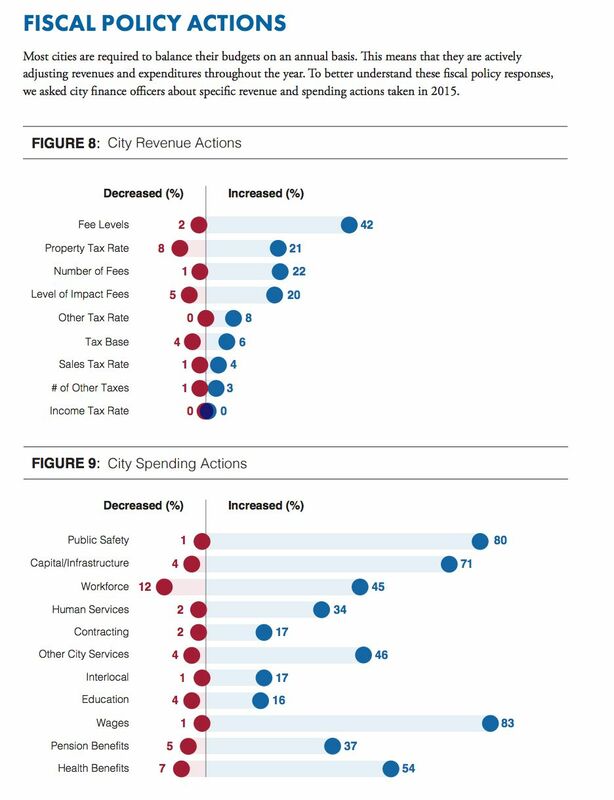 According to the new 2015 City Fiscal Conditions report from the National League of Cities (NLC), despite three consecutive years of growth, city budgets are still feeling the effects of the recession, and revenue bases are still below pre-recession levels. Still, the report says that 82 percent of finance officers say that their cities are better able to meet the financial needs of their communities in 2015 than in 2014. (In its annual report last fall, NLC cited “cautiously optimistic” municipal money managers.) Ending balances have reached pre-recession levels, even if revenues have not. “This level of optimism amongst finance officers is the highest since the inception of the survey and reflective of widespread, incremental improvements amidst an on-going slow and long recovery,” according to the report. The increase in ending balances is a sign of smart planning. Conservative estimates show that revenues likely won’t return to precession levels until 2024, and more generous estimates have revenues bouncing back by 2020. Neither of these dates looks promising for a total recovery before the next recession hits the U.S., which economists estimate will occur around 2018. 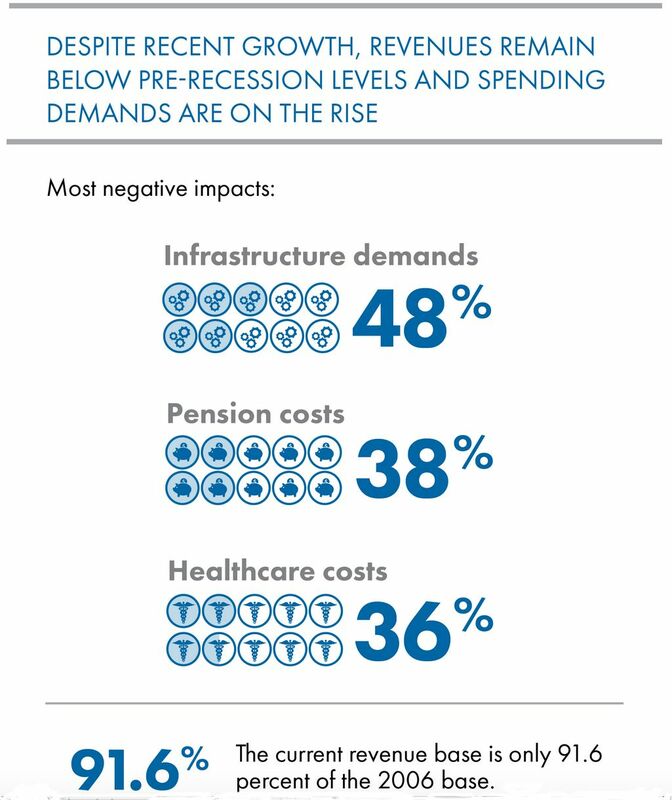 Currently, the most constraining factors on city budgets are infrastructure needs (48 percent), employee pensions (38 percent) and employee healthcare benefits (36 percent). It may not be news that America’s infrastructure is in desperate need, but the NLC makes sure to note that half of America’s cities identified “infrastructure” as one of the three most challenging issues facing cities. And just how bad is the pension crisis? Across the board, the NLC report predicts more challenging times ahead for cities — though some, like Chicago, are being hit harder than others. Chicago Mayor Rahm Emanuel, of course, has pushed for a steep property tax hike. Overall, according to the NLC, municipalities may be in an better position to manage difficult circumstances, but they could still use some help. Jenn Stanley is a freelance journalist, essayist and independent producer living in Chicago. She has an M.S. from the Medill School of Journalism at Northwestern University.